Review of Album Wild! Wild! Wild! 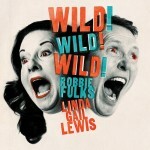 Hitting on soul, gospel and old-school country as well as rock-and-roll, Robbie Fulks and Linda Gail Lewis’ new offering is more than the roadhouse romp its title suggests and contains a few vintage-flavored ballads that just might steal the show. Mr. Fulks channels Hank Jr. on the soul twinging “I Just Lived a Country Song” and he and Ms. Lewis play the cheatin’ couple to perfection on “That’s Why They Call It Temptaion”. The Killer’s kid sister’s cover of Don Gibson’s “Who Cares” is a retro delight and standing out amongst the rockin’ fare are the Fulks/Al Anderson co-penned “It Came From The South” and the title track.